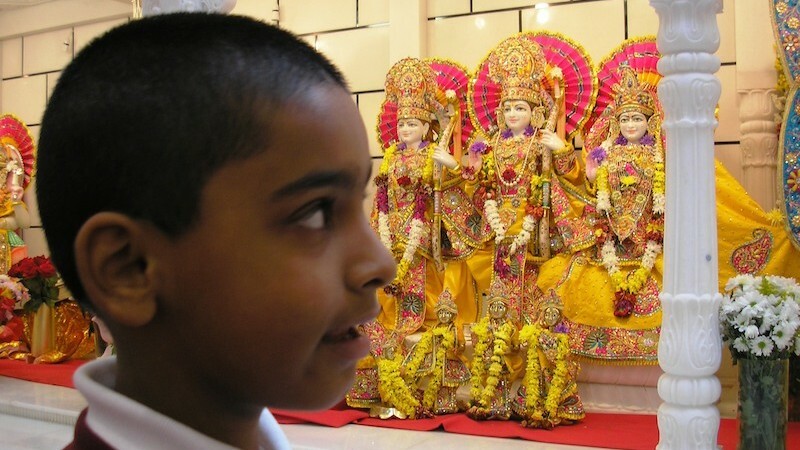 Fifty children from Years 3 and 4 participated in a series of visits to Bradford Mandir. They were accompanied by three teachers. The school has a specialist hearing impaired unit and support staff also joined the trip to enable all children to benefit in full. The school includes children from many different faiths, cultures and ethnic backgrounds who are used to working and learning together in school. However, the children have little external experience outside their own circle. There was detailed pre-visit preparation so that children were clear about behaviour and etiquette in the temple and were ready with questions and ideas. The Hindu faith tutor at Bradford Mandir greeted the children at the temple. She helped pupils gain a feel for the sacred space and showed them some of the colourful and symbolic deities. With some structured guidance, children then had time to explore for themselves. In the final session, they drew up questions in small groups and discussed similarities and differences with the other places they had visited. Just before they left the mandir, as a gift they were given a taste of prasad. The life and symbolism of a Hindu temple provided much stimulation and children were able to reflect on the meaning of the deities. Another pupil was inspired by Hanuman. Children were able to compare the faiths and cultures they had experienced. Pupils noted the variety of customs, the different significance of sacred texts, and how gender roles differed. Above all, the series of trips meant that RE was given a real human context for further learning.